The somewhat frightening wooden figurine has detailed carvings. (Photo: Norwegian Institute for Cultural Heritage Research). Right now, in connection with the development of a high-speed railway between Oslo and Ski, archaeological excavations in the Old Town of Oslo are carried out. The past week there have been made several exciting findings, including a ten centimeters high lifelike wooden figurine that archaeologists have no idea what is. The small sculpture was found on Friday by archaeologist Maria Svendsen at the Norwegian Institute for Cultural Heritage Research (NIKU) which is responsible for the excavation project. The details make the expressive face very lifelike. A close-fitting hood is covering everything except the face, from the forehead to under the chin. It also seems that a cord is attaching an ornament to the top of the head. 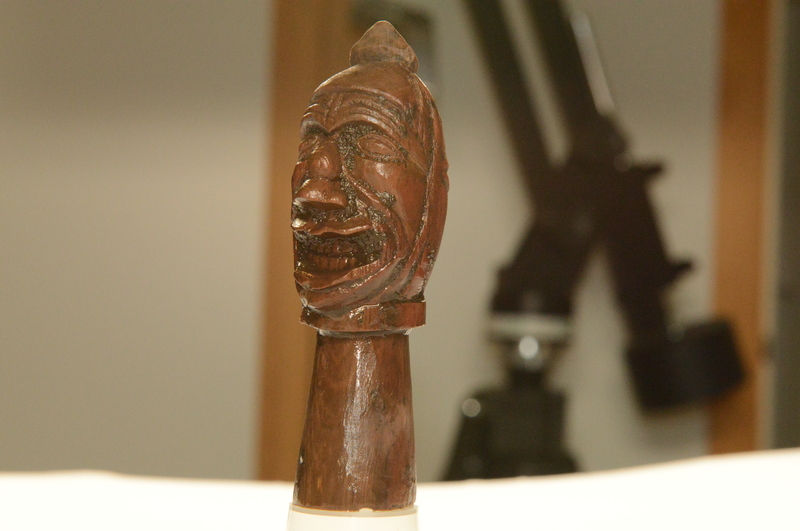 The figurine is ten centimeters (4 inches) high from the bottom of the plinth to the top of the head decoration. 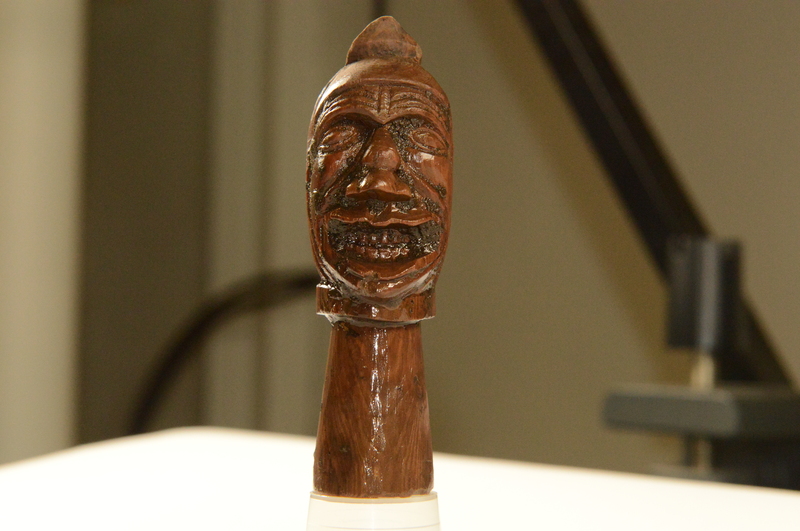 The mysterious and somewhat frightening wooden figurine is carved by a highly skilled artist. (Photo: Norwegian Institute for Cultural Heritage Research). Project Manager Egil Lindhart Bauer writes on NIKU’s archeology blog that they think it is a game piece, but so far they have not found any similar objects, in neither Norwegian nor foreign archaeological materials. The statuette was found in a cultural layer with much muck, interpreted as part of an area used as fencing for animals. There are made many discoveries in the same area, including parts of leather shoes, a beautifully decorated knife sheath and pottery shards. The wrinkles on his forehead, the marked nose and not least the wide grin with “moving lips”, makes the face very expressive. (Photo: Norwegian Institute for Cultural Heritage Research). Other findings in the same area indicate a dating to the 1200s, but researchers are uncertain. To solve the mystery, it will be searched for similar objects both in Norway and out of the country, either in the form of similar figurines or as illustrations. Oslo has an old history, founded around 1000 AD and established as a trading place in 1048 by the last great Viking king, Harald Hardrada (English: “Hard Ruler”). 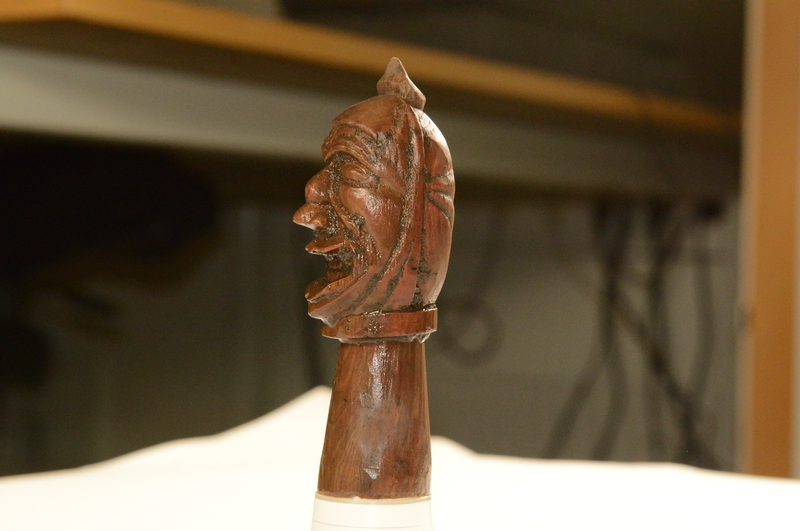 Was the figurine brought back home to Norway to prove a trip to a faraway exotic country? Please contact NIKU if you think you have any idea what the object is! Use the comments section at the NIKU blog or send an email directly to the project manager Egil Lindhart Bauer (see niku.no for contact information). I agree, it does resemble a jester or trickster totem, perhaps made to be a pommel for a weapon? I’d want to see underneath it and more angles for a better look.